Copyright SimplyRaising8 2009-2013. Powered by Blogger. We went to this last year and the kids loved it. Volunteers decorate their cars and park in the parking lot at FWC so that the kids can walk around and trick or treat to each car. I would recommend this event as a safe way to take your kids trick or treating and also enjoy seeing all the neat ways they decorate their cars. 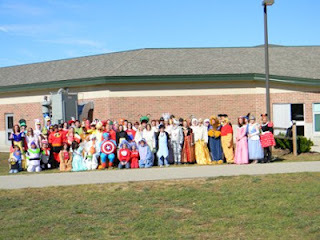 Stroll through the school meeting story book characters and Trick or Treating. This Event is made possible by the Newaygo County Prevention of Child Abuse and donations are appreciated. Call Karen at 689-5223 For information or to volunteer. They are still looking for volunteers and sponsors so If you are a business who would like to sponsor this event by donating candy to hand out to the kids It only takes 1000 pieces of candy to sponsor this event. Love your blog, thank you so much your help! Thanks, I really appreciate your kind comment!